Not very long ago, I read this post, that made me want to read this book, Way Below the Angels: the pretty clearly troubled but not even close to tragic confessions of a real live Mormon missionary. Even shorter ago, I did. While it isn’t a woman’s story, I still feel that it is worth reviewing here, in this women’s story space for two reasons. 1) The author, Craig Harline, does a fairly good job pointing out when women’s stories, voices, and presence are forgotten. 2) Harline’s ofttimes funny/ofttimes insightful words created a space for me to remember my own mission story. He wrote about his going-foreign dream, that I shared, and his going-foreign acceptance letter, that I did not share, as well as a phone call with a friend who was called stateside. I remembered my own letter and my own day, and my own comparison with a friend. I had driven to her apartment in Provo, with my letter in tow, because she received her’s the same day, and because someone told us that going-foreign letters weighed more, and thus had slightly more expensive stamps. It was true. Her’s bore the more expensive marker. When I opened mine that evening, surrounded by a small number of close friends, I forgot how to read, for approximately thirty seconds. I looked at the words, but they didn’t mean anything to me. And then they did. Sacramento, California. I read it out loud, and felt sad for approximately two more seconds, but then my friend Davis said, “Of course you’re going to Sacramento!” in an excited and kind, rather than mean way, and I remembered all of the good experiences I had had in that particular city, which was actually quite a few, because I was from exactly one state away, and drove through it every year to get to my grandma’s, and drove to it other times to watch national track meets with my dad. Harline wrote about the awkwardness of trying to speak with every person you see, and the guilt that can come when you don’t, as well as the guilt that can come even when you do. I felt responsibility and guilt for whole cities, as well as myself, for infractions as small as arriving home three minutes late. Many days, for many months, I would look at a picture of Christ we had facing outward in one of our apartment windows, and sense His eyes looking back at me, in disappointment. Thankfully, Harline also wrote about how with other people, in different places (and sometimes with the same people, and the same places), missionary work could be a joy and a delight. Even more thankfully, I knew what he meant, because I experienced that, too. He wrote about hard weather, and hard hours to do missionary work in. For him, poor weather was gray weather, that made everything gray, and a wet and cold that made everything wet and cold. Hard hours were all of them, but especially holidays, dinner times, and so forth. For me, poor weather was 110+ weather that would make me pray really hard for every person who offered us water at their door, even when they weren’t interested in what we were offering them. Hard hours were morning hours when few people were home, and hardest hours were the nighttime ones, when it was almost, but not quite, time for us to go home. Harline had a phrase for some of the people he would visit in those times: Precious Old Ladies. I didn’t have the phrase, but had them too. The one difference was that his were not LDS and not interested in being LDS. Mine were very LDS. They were the types of widows Tommy Monson always talked about visiting, so I always felt like time spent with them was among the best time. He wrote about letters being like gold, especially if they were from a certain person he thought might be like gold. I remembered that he was exactly right. Even though my gold person would remain gold, but also one day come out as gay. He wrote about some things that I can’t write about, like aspiring to leadership callings, including District Leader, Zone Leader, and Assistant to the President. The only leadership opportunity open to me was Senior Companion. *** It came halfway through my third transfer, when my beloved called-to-Temple-Square companion went back to Temple Square, and… became an Assistant. My first preparation day in the field, I saw a stack of just-released Harry Potter and the Half-blood Prince’s sitting on a table in a store, and had to repeat “Sacrifice brings forth the blessings of heaven” over and over in my head, to be able to walk past. I had to recite it again when we checked our email at the local library and the local teens were on Myspace. And again a few days after that when a local teenager we were teaching told me that Dumbledore died. I also had to pray very hard to forgive her. When I did, my companion and I gave her Hogwarts-eque letters inviting her to be baptized, with pictures of us wearing robes and riding broomsticks into the meeting house and font. I remembered my worst week, from my worst letter,**** that brought so many tears, every night, when I was finally in a space where I could cry. I remember coming home one day, during that worst week, and finding the biggest flat of farm picked strawberries on my desk, during a broader period when all I wanted to eat were farm picked strawberries. There was a note from one of the Spanish speaking Sisters in our shared apartment that simply said, “From my people.” Grateful tears came then, and loved ones, and not-as-alone-as-I thought ones. Like everyone, you have a story you want your life to tell…God’s work in your life is bigger than the story you’d like that life to tell. His life is bigger than your plans, goals, or fears. To save your life, you’ll have to lay down your stories and, minute by minute, day by day, give your life back to him. Like every missionary, Harline had a story he wanted his mission to tell, and it was both bigger and smaller than God’s work in his mission. My very favorite parts of this very good book are every time he writes about this genuine story struggle, and the quiet places he gets to where a little tiny bit of light can break in, and he hears something simple like, “Be yourself,” or “Not this. Not this. This.” or ‘Eat three meals a day, rather than only two,’ or ‘Be a friend.’ And he tries, and forgets, and tries again. And his story gets big enough to talk to the foreign people that are not so foreign to God as real human beings, rather than as someone he needs to conquer or convert. Love breaks in, as well. Jesus had a pretty strong view about friends, as in laying your life down for them.. That’s what the whole mission business was about, it now seemed to me. Maybe even the whole religion business. Maybe even the whole life business. I recommend reading this book. It is both more funny, and more thoughtful than I know how to describe, and the themes it considers are important for anyone, missionary or not. If you have served a mission, memories will flood back, in beautiful, and perhaps painful ways. If you are preparing to serve a mission, it more accurately describes what makes a mission hard than anything I have previously read. It also describes what can make one good, for an individual missionary, and how missions as a whole could be made better (hint: more Real service). There is not One True Story to tell, about being a Mormon Missionary, a Mormon Mother, a Mormon Feminist, a Human Being. There are many stories and many people. And a God who can work inside of them. What stories and experiences do you have to tell, about being a Mormon Missionary or Human Being? What stories and experiences do you have to tell about trying to find that quiet, light filled space, where you can hear yourself, and maybe even possibly God? **As a mom with a small baby-child, I can attest that it isn’t easy to be with someone nearly every second of the day, even then. ***Today’s Sister Missionaries can aspire to lead whole groups of sisters. What a wonderful post, Rachel. I love the way you weave your own mission experiences into your discussion about this book. I never served a mission, so this is such an interesting glimpse into missionary life and experiences, particularly for a sister missionary. I think the story of my life will center around the tension I feel as a Mormon feminist. It’s a difficult place to be in, but it’s also wonderful. My life is so much better because of Mormon feminism and the people I have met through it. Yours is a beautiful, inspiring, and challenging story. My life is so much better because of Mormon feminism too. 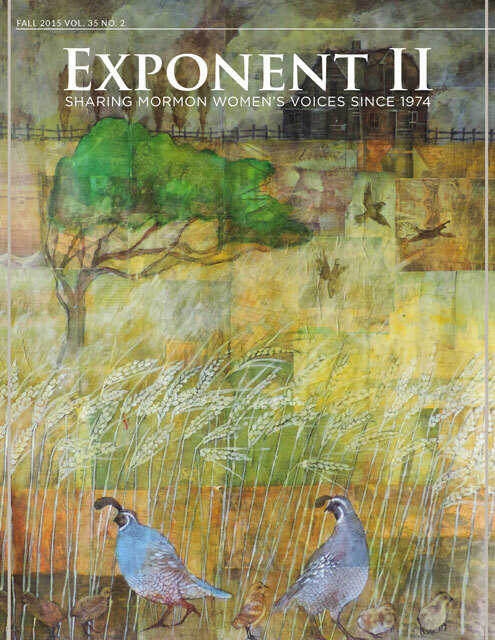 Thank you for being a big part of that, and introducing me to Exponent. Rachel, I love the peek this gives me of you as a missionary. It is beautiful and I hope you write those stories from your mission. And share them. Like Caroline, I didn’t go on a mission, but love to hear others’ missionary stories. And Mormon Mother, Mormon Feminist, and Human Being stories as well. Hooray for stories! Let’s tell more of them. And write them down. Thank you, Brooke! I was a terrible journal keeper on my mission. At least when I was happy. (I only wrote when I was sad.) I want to write more of the things I remember. The book helped them come and come and come, so I have been jotting lots of notes, to fill out later. I intended to write a Mormon Mother story this week, but it turned out to be too hard. I think because I am still living it, and it is still murky. I am going to try to be better at telling stories (good and bad) while I’m in them. I love your “Hooray for stories!” I add three cheers. Daughter on mission…comes home at the end of the month…loved the review…made me cry pathetic-missionary-dad-who-is-glad-to-cry-for-his-wonderful-daughter-on-a-mission tears…gearing up to worry about her adjustment to coming home. I haven’t read it yet, but have read one favorable review from C. Jane Kendrick. Thanks for this, Rachel. My copy of Harline’s book arrived in the mail on Monday and I started reading it last night. Those first several pages and perhaps even moreso, your own thoughts here, have already triggered many, many memories (both good and not-so-good) of my own mission over a decade ago. You are welcome for this, Christopher. I would love to learn more of your thoughts after you’ve finished reading. I imagine more of those good and not-so-good memories will come, if only because they did for me. A mission really is both of those things (aka: good and not-so-good) which is why I think I appreciated the book so much. It doesn’t just try to say that missions are perfectly perfect or terribly terrible. And years and years later, they can still have such a profound effect. This sounds like a book I should ask my kids to read if they serve missions. And a good Christmas present for my husband. Thanks for reviewing it here, Rachel. I really enjoyed reading your experiences along side highlights from the book. I plan to do that very thing with my kid(s), Emily U. My husband laughed a lot at the parts that I read out loud. You are welcome. Thank you for your comment and kind words. Also, I am not sure that I would have been able to forgive someone for telling me that Dumbledore died. Thank you. I really believe it. I loved the book, and very much appreciated this thoughtful review. Amen, and you are very welcome. As per usual, I feel like we’re twins. I also had HP6 come out in my first transfer, and I died a little to see everyone reading it everywhere I went. Nobody ruined it for me though, which I see was a tender mercy. I also remember the weird feeling of guilt/power — that my tiny acts of disobedience were somehow cursing the town with withholding the Gospel. And I mean tiny, because I tried hard. My mission president’s wife expressed a preference that we wear rings only on our ring fingers — I had been wearing my CTR ring on my middle finger! Was THAT the reason nobody listened to us? Before I came out the mission president asked the mission to read the D&C by Joseph Smith’s birthday in December, but then never reiterated this challenge while I was there. I found out about it two weeks before the deadline and read frantically to make it. Maybe THAT was the reason nobody wanted to listen. One lunch time we saw the mailman coming and just waited an extra 5 minutes to get the mail. That was probably why nobody listened that day. Retrospectively I see that it was compulsive and a little pathological but at the time it had a perfect internal logic. I am certain that I would have been a better missionary had I felt only appropriate levels of responsibility, and been more well rested, and exercised, and less stressed out and/or pressured (not ever by my Mission President, but sometimes by presumably well-meaning Elders). How do we help future missionaries not feel the things we felt? Is it as simple as not emphasizing “obedience with exactness” and replacing it with “love.”? I don’t know. I think the problem is that one model will never fit everyone. There were certainly missionaries who could have been a lot more obedient and worked quite a bit harder. I assume they were the targets of the “exact obedience” thing, because it just made me neurotic and miserable. It could be somewhat gendered, there is often a big difference in tone between GC talks directed at women and GC talks directed at men. I hesitate to make those sweeping generalizations. But for me, I do a lot better with a huge dose of “you’re doing okay!” with a tiny little sprinkle of “but this area could be a bit better” because I will take it all to heart and magnify all criticism dramatically. When I first heard of this book, I was disinterested because I am not male and did not serve a mission. But reading your review made me see that there are universal truths in the experiences of loneliness, disappointment and a love for friends. I think it is because you related your experiences, and thus taught me to see beyond the basis of the book to get to the heart of surviving something done for love and sacrifice. It makes me want to read your missionary memoir, as well as Harline’s. Thank you for sharing this, reading this post made my day. I was going to leave this exact comment. Thank you for bringing this book to life, and for this post! I also hope to read your memoir someday. Liz, you are welcome. I hope that same hope, for you and me! Spunky, I wish we lived close enough so I could walk (or bike, or drive) to your house, and lend you my copy. I love your sentence about the heart of the book, which is”the heart of surviving something done for love and sacrifice.” That description fits so many of the normal hard life things, I think. It makes me want to have a mission memoir for you to read. Welcome, and I’m sincerely glad that your day was made at all brighter. Thanks so much for the review, and interesting account of your own experiences Rachel. I could relate to almost all of them, and to subsequent comments, especially those expressing fears that maybe it was wearing a ring on the wrong finger, etc., that prevented you from converting people. Introspection is always good, but it can get damaging too, I think, because you can always find something wrong with yourself, always something to improve. Only when I accepted it would always be that way, instead of thinking I could fix everything, did I start finding some peace. It was sometimes too heavy to think about, which was why it helped to try to put some humor into telling about it. Thanks again. It is nice to know I’m not the only person who did that — but if the crazy is so widespread, and probably damaging, shouldn’t that be addressed? EM, I think some do address it, but I’m not sure such things will ever be completely eliminated. Some of the things I write about have changed for the better in a general way, but not everywhere or with everyone. Still, one thing that will help is for people to tell more stories, not only so that others realize they’re not alone, but so that more people are aware of this sort of thing. I think telling more stories is the answer, too. Or at least part of the answer. Especially when they are the more full, genuine kind of stories, that include the harrowing with the hopeful. I suspect very strongly that it would have helped me during my own mission time to know that anyone else felt the way that I did, at the time when I was feeling them. Sorry! But I also meant to say that more books about female missionaries would be a good and interesting thing, especially about those who worked in the Stone Age, like me, when they were in a small minority and had to negotiate a male-dominated culture. But seeing how that culture, though still heavily male, is now changing, thanks to the new surge of female missionaries, would be interesting as well. So please write away Rachel, and many others. Thank you for this review, Rachel. I have been trying to psyche myself up to read Craig’s book since before it came out. Over ten years after I got home from my mission, I am still trying to find a place for it in my life–somewhere between the idealized “best two years” and a traumatic mistake that permanently scarred me and paved the way for my later disaffection and distrust of church authority figures. The truth is complicated, and someday I hope to be able to write about my mission with the same grace and honesty as you and Craig. You are welcome, Sarah. Reading it might help. I have been home for almost eight years, and at least somewhat understand what you mean. A mission is such a strange (and sometimes noble) beast. It is hard to place. We need more stories like “Way Below the Angels” that lets it be that in between thing. Some of my mixed feelings about my mission are that I am immensely grateful that I went, but also immensely grateful that it’s over, and not immensely sure that I would have been brave enough to go with the knowledge I have now. Please write your messy, beautiful, honest truth. Loved reading this review, Rachel. It made the book sound like a wonderful read. And offered such interesting and poignant insights into missionary experience for someone who has never had it, both through Harline’s stories and your own. On a side note, I took a class from Craig many years ago as a BYU student. It remains one of my favorite class memories at BYU. It was hard. But so fascinating and worth the effort. So great to be alerted to this new book of his, which I hadn’t heard about yet. I think it may just be the gift I give my brother’s family for Christmas. It really was wonderful. And the good kind of don’t-want-to-put-down fast. Thank you for the nice words about my experiences. On that side note, I can imagine a class from him would be great. The book talks a bit about his fun-loving-historian-self, and how he came to be such. If you do gift it, I hope (and trust) that your brother’s family will enjoy it. Never went on a mission, but had a son serve. Craig’s three children and wife served missions. What a blessing to have been able to read this book. It expanded my understanding in so many ways. If I ever decide to serve a mission, I will be a better missionary and leader because of Harline’s book. Thanks also for your insights Rachel. I saw in his book, that, and where, they served. It brought greater significance to the dedication page. If a child of mine ever decides to serve a mission, I will actively encourage them to read this book, because of the things that you mention, and more. Thanks for this, Rachel. I love the interleaving of your experiences with Harline’s. I particularly like this line of yours: “Hard hours were morning hours when few people were home, and hardest hours were the nighttime ones, when it was almost, but not quite, time for us to go home.” So true to my experience too! You are welcome for this, Ziff. I wanted to go home home during those nighttime hours, every day for approximately six months. But still somehow that time passed. I am impressed that Harline noticed many of the ways women were excluded in the mission field. I was a missionary, too, and it is all-encompassing, exhausting work, completed by young, inexperienced people, so I don’t even blame the elders for not noticing the many ways female missionaries are excluded. I do expect better of their older, more mature priesthood leaders, but my expectations are usually disappointed. His wife and daughter both served, which might have helped, though I admittedly suspect this from my own mission experience, where many of the best, most thoughtful, and genuinely respectful Elders were the same ones who had sisters in the field, presently or previously.